The probabilistic analysis of the seismic performance of a structure requires quantifying the uncertainties of the involved variables and parameters, including the seismic action and mechanical properties of its elements. In this article, the seismic performance of high-rise, mid-rise and low-rise of steel buildings, subjected to long duration seismic actions like those of Mexico City, is analyzed. The analysis is conducted by using a probabilistic approach. The seismic actions are selected to be compatible with the design spectra of the Mexican seismic code for soft soils and long duration earthquakes, characteristic for this region. The dynamic analyses are performed by using Monte Carlo simulations. The strength and ductility of the beams and columns are considered random variables; the seismic actions are also modelled in a probabilistic way. The damage index of Park and Ang is used. The results show that the uncertainties expected in the response are significant, being the randomness of the seismic action the main cause. From the comparison between the mean values of the probabilistic approach and those corresponding to the deterministic case, a good consistency of the result obtained for low-rise and mid-rise buildings is observed. Nevertheless, the consistency is lower in the case of high-rise buildings. The analyzed low-rise and mid-rise buildings show a good seismic performance to seismic actions, but the high-rise buildings show slight or moderate damage. It is concluded that the probabilistic approach provides a more complete information on the structural response. Díaz, S. A., Pujades, L.G., Barbat, A. H., Hidalgo, D. A., Vargas, Y.F. 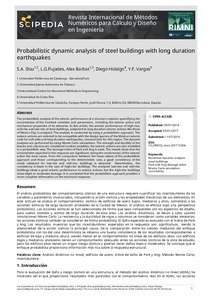 Probabilistic dynamic analysis of steel buildings with long duration earthquakes. "Revista internacional de métodos numéricos para cálculo y diseño en ingeniería", Gener 2018, vol. 34, núm. 1, p. 1-13.